I think the whole spoon-fed (my biggest critique in that the show really does not trust the audience and the characters explain EVERYTHING they are feeling), melodramatic (not in the good way like Far From Heaven) thing is something This is Us is definitely guilty of. I wonder if it works better in a TV format where they have like 18+ episodes to spread it out and have parts where it’s not like that. In a roughly 2 hour film, I can see the worst excesses of This is Us happening without reprieve the way a spreading it out in 18 episodes gives. I also think the audience for This is Us likes being spoon-fed emotions and thoughts the characters are having like a book. ETA: I just watched the trailer and gosh, even Oscar Isaac’s spiel about asking Olivia Wilde out at the very beginning was way too much exposition and needless explanation of things Fogelman should have felt he could trust the audience to understand. The whole thing is like something cheesy “Jack” would say in This is Us. It’d be one thing if what he was saying was interesting, like in a monologue in a well-written play, but it wasn’t. Who knows? Maybe the fans of This is Us would actually fawn for it the way they fawn over what is essentially the same thing in This is Us. This reply was modified 7 months, 1 week ago by SHT L.
Critics are being UNFAIRLY HARSH to towards this film. Saw it last night and it is not the horrible movie everyone thus far posting is making it out to be. 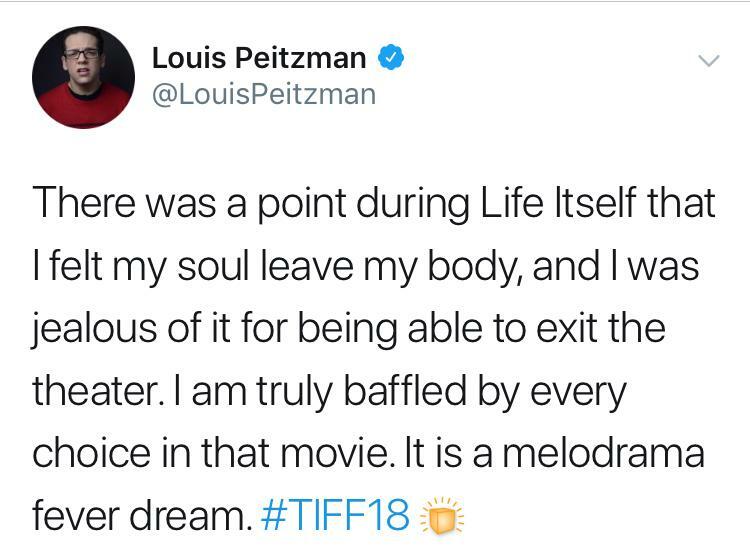 The cast was phenomenal and the overall structure of the film was unique and engaging. Also, special shout-out to Antonio B., who I had no idea could be this good. It’s emotional, but in a completely realistic way and does not feel “cheesey” at all. Highly recommend, as it’s easily one of the best film released (or soon to be) so far this year.